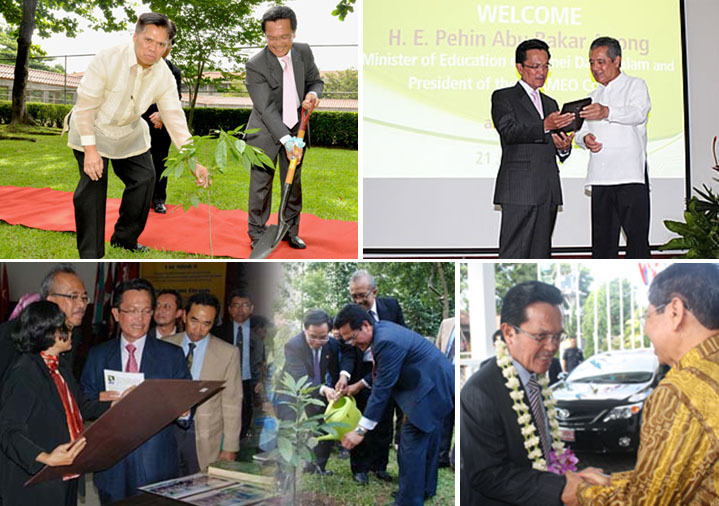 His Excellency Pehin Abu Bakar Apong, President of SEAMEO Council and Minister of Education, Brunei Darussalam visited Malaysia and the Philippines on 18-22 June 2012, and Indonesia on 2-3 July 2012 as part of his round of visits to the SEAMEO Member Countries in his capacity as SEAMEO Council President. 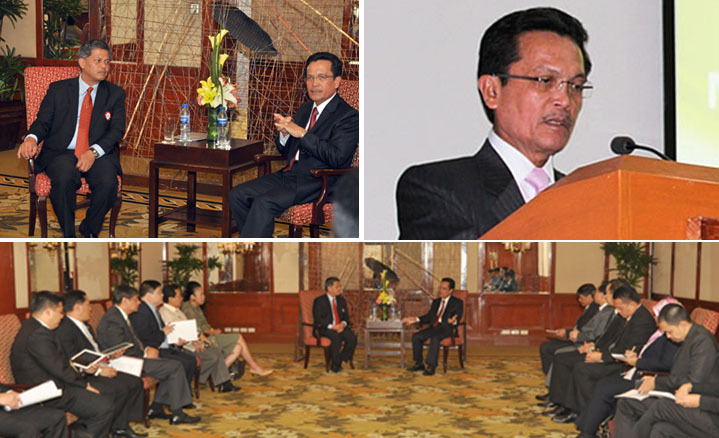 The highlight of his visit includes the signing of Enabling Instrument and Memorandum of Understanding of SEAMEO SEN in Malaysia, visits to the ministries of Education in Malaysia, the Philippines, and Indonesia; and meetings with Centre Directors and key staff of SEAMEO Centres in these three countries. During his visits, the SEAMEO Council President discussed about the various initiatives that SEAMEO undertakes to attain the goal of Golden SEAMEO which were outlined in the 2011-2020 SEAMEO Strategic Plan. He also shared the current endeavor to promote SEAMEO's image and identity such as holding the SEAMEO Cultural Week in SEAMEO Member Countries. During his visit, the SEAMEO Council President paid courtesy calls on H E Tan Sri Dato' Haji Muhyiddin bin Hj Yassin, Deputy Prime Minister and Minister of Education, Malaysia; on H E Br Armin A Luistro, FSC, Secretary of Education, Philippines; and on H E Prof Dr Muhammad Nuh, Minister of Education and Culture, Indonesia. He also visited and discussed with the Centre Directors and key officials of SEAMEO RECSAM in Malaysia; SEAMEO TROPMED, SEAMEO SEARCA and SEAMEO INNOTECH in the Philippines; SEAMEO BIOTROP, SEAMEO RECFON, SEAMEO SEAMOLEC, and SEAMEO QITEP in Mathematics in Indonesia. The SEAMEO Council President was accompanied by Dr Witaya Jeradechakul, Director, SEAMEO Secretariat and officials from the Ministry of Education, Brunei Darussalam. H E Pehin Abu Bakar Apong was elected President of the SEAMEO Council during its 46th Conference held from 26 to 29 January 2011 in Jerudong, Brunei Darussalam. During the same Conference, the SEAMEO Council endorsed that from 2011 onwards, the Presidency of the SEAMEO Council would extend from one year to two years, effectively extending the tenure of the SEAMEO Council President until January 2013. (Clockwise) (1) The SEAMEO Council President receives a token from Dr Gil T Saguiguit, Centre Director, SEAMEO SEARCA; (2) the SEAMEO Council President is welcomed by Mr Subanar, Centre Director, SEAMEO QITEP in Mathematics; (3) the SEAMEO Council President waters a young tree and is assisted by Dr Witaya Jeradechakul, Director, SEAMEO Secretariat and Dr Bambang Purwantara, Centre Director, SEAMEO BIOTROP; (4) Centre Director and other key officials of SEAMEO BIOTROP present exhibits to the SEAMEO Council President; (5) SEAMEO Council President and Dr Ramon C Bacani, Centre Director of SEAMEO INNOTECH plant a tree seedling.